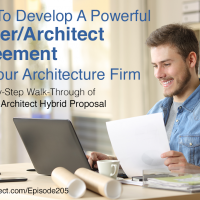 If you purchase the Hybrid Proposal Digital Course TODAY – including complete documents ready for you to edit for your small firm – we will throw in a FREE bonus including access to the Construction Management for Small Firm Architects Course and the GetFocused Productivity Course for Small Firm Architects . That’s over $600 for only $197. The offer ends Friday, February 2, 2018 at 11:59PM ET! Click HERE to receive BOTH the video course AND the complete template package that’s ready to edit and help you sign more projects and make more money today! About 10 years ago, Mark was inspired by a talk to create his own owner architect agreement, one that works for his small firm. It needed to be easy to understand, look friendly, and be an integral part of his firm’s simple sales system. How can we go from prospect to project as effectively and efficiently as possible? After a decade of slow evolution, it’s the best small firm agreement. 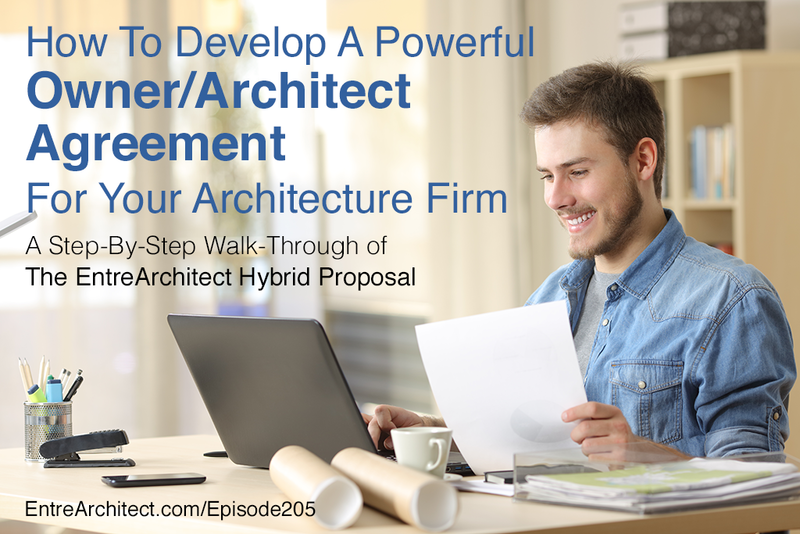 This week at EntreArchitect Podcast, How to Develop a Powerful Owner Architect Agreement for Your Architecture Firm. Note: EntreArchitect strongly advises that you have your attorney and insurance company review all of your legal documents. Why is it called a “hybrid proposal”? It’s both a proposal and an agreement. Typically, architects send out a letter of proposal defining what they understand the project to be. If they are ready to move forward, the architect prepares a legal agreement for the prospect to review and agree to. Mark created the Hybrid Proposal to condense both actions into one simple step. Next, Mark developed the hybrid fee with gives the client a flat fee and a percentage fee. The cover letter is a simple form letter. It has a logo and a return address, but the intent is to explain to clients what we’re going to do and give them a call to action as to what next steps to take. The next part explains what was discussed at the meeting and what will happen next. All of this is malleable, but is the first step. Next, the prospective client can sign and initial the proposal and return with the initial payment to the firm. This six-page document is incredibly user friendly. Use your design skills to make it look appealing. Make it clear and easy to understand. Do you want to be more efficient and make more money? Find a target market and create a template proposal that fits your needs. Then you can use it over and over again! We also get into the different phases of architecture, including the pre design and architectural services. Explain the process you’re going to go through to execute your client’s project. EntreArchitect also includes construction administration as another phase of their process and fee. An initial payment is taken up front and held as a credit until the final payment. The hybrid language says that compensation for basic architectural services is a stipulated sum fee per the attached compensation schedule. After schematic design, we know the scope and the budget, and we can make the project based on our stipulated sum. It doesn’t need to be perfect, just start confirming that you’re understanding what they want. This two page part is intentionally short to make it more manageable. The legal terms – including compensation, services, and more – are all put into easy-to-read terms. This section also includes photography rights, insurance, dispute resolution, and more. This is a standard document that lists clients’ names and locations to for prospective clients to take a look at and reach out. Mark’s code system allows them to easily find like projects so that they can obtain references from people who have similar projects to what they’re looking for. TODAY ONLY! Purchase the Hybrid Proposal Digital Course and receive BOTH the video course AND the complete template package to help you sign more projects and make more money today! Click HERE to claim yours by midnight!